This is one of a series of posts written in celebration of Women's History Month, and profiling additions of new images of female scientists to the "Women in Science" set on the Smithsonian Flickr Commons. We invite you to subscribe to The Bigger Picture blog to keep up with new posts, and to help us identify some of the unidientified scientists in our "Women in Science" set. Mary (May) Gorslin Preston Slosson quietly lived a life of unprecedented achievements. She was one of few women in the United States granted opportunity to pursue and receive a PhD prior to the twentieth century, she served as Chaplain at a penitentiary consisting of a 98 percent male population that petitioned for her appointment, and she was an early leader and advocate of the women’s suffrage movement. A noteworthy resume, indeed, and yet one really has to scour the web to unearth the details of her curious story. Born on September 10, 1858 in Ilion, New York to Reverend Levi Campbell Preston and Mary Gorslin, a graduate of Whitestown Seminary, May Goslin Preston was raised on a farm where hard work, education, and religion were fundamental to enjoying a complete life. 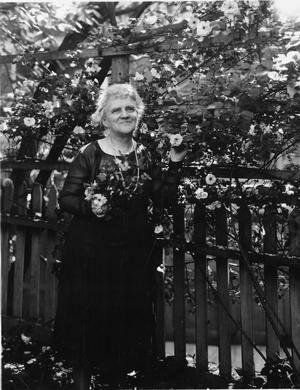 Her progressive minded parents encouraged May to seek her own course and persevere towards her goals at a time when the aspirations of many young women were limited to finding a good husband. She attended Hillsdale College in Michigan, receiving her BS degree in 1878, and her MS degree in 1879. May was admitted into a philosophy PhD program at Cornell University, and in 1880 became the first woman to receive a PhD from the prestigious institution. Soon after, her career as an educator began at Hastings College in Nebraska where she accepted a Professorship of Greek. On August 12, 1891, May Goslin Preston married Edwin E. Slosson in Centralia, Kansas. Around that time, May was serving as Assistant Principal at Sabetha High School in Kansas and Edwin Slosson was finishing his MS degree from the University of Kansas. 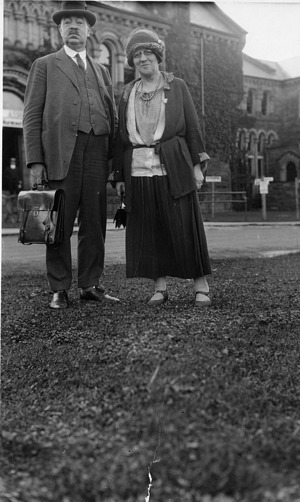 In 1892, her husband accepted a position as Professor of Chemistry at the University of Wyoming, and the Slossons moved to Laramie. Wyoming was rather unique during that time, in that women were granted equal status to men on many levels. Women had received the right to vote in 1869, and women teachers reportedly received equal pay to that of men. Such “liberties” were rare in nineteenth century United States, and the people of Wyoming thrived employing this philosophy of equality. It was in Laramie that Dr. Slosson’s career would take its next unexpected, trailblazing turn. She approached Laramie Penitentiary authorities with a notion of holding a series of Sunday afternoon talks and lectures conducted at the prison by University of Wyoming professors. 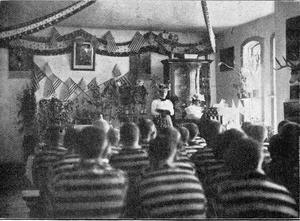 To this day, the Wyoming Territorial Prison continues to hold lectures as part of the Dr. May Preston Slosson Historical Lecture Series. Ironically, her idea for the lecture series was born from the notion that idle minds begin to lose their sense of individuality and purpose. I wonder if this idea stemmed from observing prisoners, or observing women left without the encouragement or means to pursue their interests and goals. Dr. Slosson was so admired by the prisoners, that when the minister acting as the chaplain to the prison left Laramie, the prisoners petitioned the governor to appoint her as Prison Chaplain. In July 1899, Slosson became the first woman to officially serve in this capacity in Wyoming, and perhaps the United States. She held this position until at least 1903, but my research did not find an end date to this appointment. Your assistance with identifying the end date would be appreciated. The Slossons remained in Laramie until 1903, at which time Edwin, having received his PhD in Chemistry from the University of Chicago, accepted a series of positions in New York as a magazine editor; a founder of Columbia University’s School of Journalism; and later, as the head of the newly formed Science Service, a not-for-profit institution founded to increase and improve the public dissemination of scientific information. The Slossons continued their support of the women’s suffrage movement, and witnessed voting equality for the sexes with the passage of the 19th Amendment in August 1920. They had one son, Preston Slosson, born 1892, who embraced the educational values and progressive philosophies of his parents and later became a professor and writer. Dr. May Preston Slosson heeded her parents’ advice and embraced the challenges life presented. She humbly forged her own path, and was instrumental in opening barriers that had traditionally withheld women from achieving personal and intellectual freedom. She died in November 1943, having outlived her husband by fourteen years. Her legacy and achievements as a woman in an age dominated by men, remains as an unassuming footnote in women’s history—perhaps too much so.